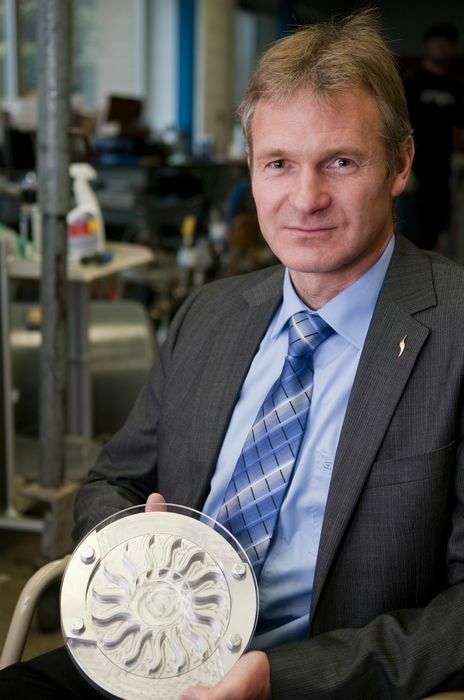 The Department of Energy’s ARPA-E program has been funding programs to increase fuel efficiency in cars and one program in particular is showing great promise. 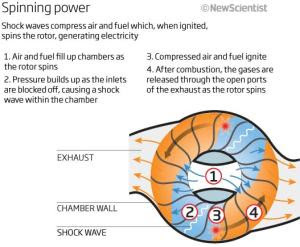 It’s called the Wave Disk Engine and it works quite differently than a standard internal combustion engine. 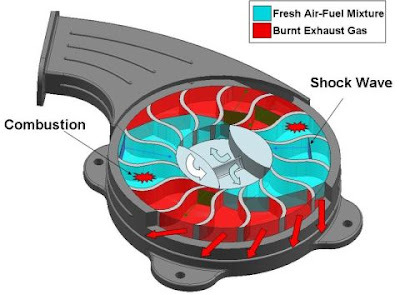 The entire engine is composed of a spinning disk which draws in a gas / air mixture in from the center, ignites the mixture causing the disk to spin faster, then expels out the exhaust from the sides of the disk. Since there are no intake or exhaust ports that are mechanically activated, no pistons, cams or crankshafts this engine is much more efficient than standard engines. How much more efficient? Well, about 3.5 times more efficient, while being 30% lighter, costs 30% less to make, and could possibly reduce emissions by a whopping 90%! Since this motor works best when operating at capacity, it would function most efficiently when operating in a hybrid type vehicle making electricity for an electric motor. The designers are currently working on a 35 horsepower motor which should be ready in 2013. While 35 horsepower isn’t much, when used to charge batteries in a hybrid, it could be enough to power a small car. Large versions will eventually be made to cope with the demands of larger or sport vehicles. What strikes me as interesting is the simplicity of this engine. It’s higher operating temperature almost negates the need for a cooling system, while increasing the efficiency of the engine itself. The lack of a large amount of moving parts should increase the lifespan of the engine while cutting down on repair bills. It doesn’t even need an ignition source or timing system, as shock-waves from the rapidly spinning air-fuel mixture ignites the gases at the precise moment. This new engine is engineering at it’s finest in a time when we really need some great engineering to save us from our greedy fuel consumption habits. Let’s hope that automobile manufacturers are willing to test this new product out so we can jump into our Wave Disk powered cars by 2014 or 2015. I wish there was more information with respect to the milestones for this project. Information I had seen earlier suggested that the engine would ne available at the end of 2011. Now it looks like 2013. Doaes anyone have more specific information or a 2011 progress report? ARPA-E is funding Michigan State University to the tune of $2.54 M for a project time period from 1-15-2010 to 1-14-2012. I've looked for instances of a promise of a working wave engine by 2011, but couldn't find any. It seems that they had to jump through some hoops to get the ARPA-E funding and I'm not sure that it will be renewed - so they have got to get a working demonstration set up before their funding runs out (Q1 - 2012). I want to see them succeed and have a working engine ready - yesterday if possible. I'm afraid we'll just have to wait and see.